“So, just how exactly do you plan on filling your time in early retirement?” she asked me, pen and pad in hand, ready to record my exact answer to the quiz. Sure, early retirement sounds great, and I’ve been drawn to some notion of it for as long as I can remember. Who wouldn’t want enough money to do whatever they wanted? But I was always driven by something a little more fuzzy and a little less exact. The freedom was always the light at the end of the tunnel, but as I sat here in the hot seat of an inquisitive reporter, I realized without more clearly defining the goal, I could be setting myself up for disappointment. The last thing I want is to become that classic prisoner from the movies, who avoids the watchful eyes of the guards, escapes the confines of his cell, and climbs the prison wall… only to realize he’s been held captive on an island all this time. And so the reporter sat, waiting for my answer to the question. Live to Work, Work to Live, or Just Live to Live? It was a fair question after all. Work keeps people busy. It gives a sense of purpose. It makes people feel important, even if a day of spreadsheets and meetings might not be as meaningful as we like to believe. If we have an cush job, we work 9 hours a day for 5 out of 7 days every week. Half of us work more. This fills a lot of time. And then there’s the time preparing for work, when we’re not working! The hour in the morning putting on weird clothes, or the 30 minute bookends to the workday, where millions of people risk their lives during the mad vehicular rush, to and from. All of this leaves just a fraction of the day for ourselves. With a chunk of this “us” time spent fueling up for dinner and passing out for sleep, an extra-terrestrial onlooker would be reasonable in thinking our job is our entire purpose in life! In the same light, a person caught in the rat race would be reasonable in thinking there’s no reason to retire, because there would be nothing to do! With so little time to do what we want, it’s no wonder we’re intimidated at the idea of extended free time. We haven’t ever learned, or maybe we’ve forgotten, how to be free. We all know the person defined by their career. No thanks. I’d rather have a life. But just what would that life look like, in the absence of a career? Just what the hell am I working towards all this time? I’m not talking about the YOLO planning, going for broke, “the world is ending tomorrow” sort of celebrations. Even world famous rockstars can’t usually find happiness in that empty lifestyle before they hop on the vicious cycle of depression and drug use. No, what really makes you happy? If you’re like most humans, it’s probably not a bunch of stuff to impress people who don’t care about you or said stuff. Hedonic adaptation has already proven that to be a losing battle. And it’s probably not a bunch of empty relationships that, suspiciously, become easier to obtain the richer you get. In fact, you probably don’t even have to look very far to find what makes you tick. Think back to those cracks of freedom. Those few hours to yourself. Chances are, you’re already sneaking in your true sources of happiness during the glimpses of retirement you already have. Imagine your weeknights with no plans, or your weekends where the chores have subsided long enough to let you work on that passion project, spend time with the most important people in your life, or find your own perfect style of relaxation. Now imagine a whole day. What does that perfect day look like? Get specific. Really plan it out! It’s a fun topic to daydream about. 8:00 AM – Wake up after a full night’s sleep. 8:00 to 9:00 – Leisurely breakfast. Maybe a cup of tea on the porch while I collect my thoughts, and some easy scrambled eggs while I plan out the day. 9:00 to 11:00 – write for this site. I love the creative outlet this blog provides, and it fills my day with a sense of accomplishment. I’d love to weight lift three days a week, do Yoga twice a week (guys, don’t knock it until you’ve tried it!) and enjoy some walks and bike rides when the weather is nice. The immediate endorphin boost would make me happy in the short term, and the greater life expectancy and overall health benefits would reward me in the long term. 12:30 to 1:30 – lunch. At a leisurely pace, of course. 1:30 to 5:00 – Whatever strikes my interest. Whether it’s chores, volunteering, a few hours at a part time job, writing some more, or working on some hobbies. 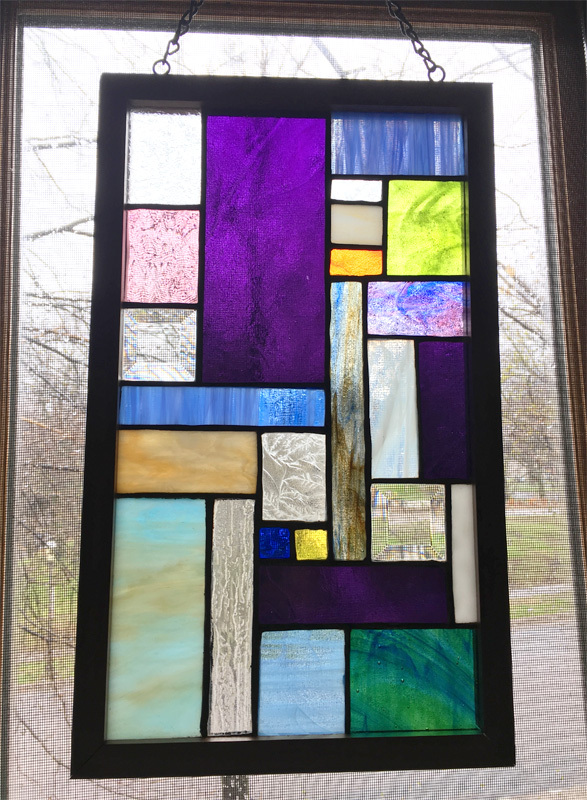 I’ve wanted to make more stained glass projects and become a better drawer, but I rarely have the time. 5:00 to 7:00 – Whip up an awesome dinner. I love spending hours in the kitchen making something delicious or experimenting with a new recipe. 8:00 to 9:00 – Who doesn’t love a little TV or movie time? 9:00 to 11:00 – Nothing better than ending the day with a good book. Well, that was easier than I thought. I’m not seeing any boredom in that schedule, and there’s a whole host of curveballs we haven’t even considered yet. Traveling and vacations, visiting family, date nights with the girlfriend, and time spent with friends can all provide an endless source of entertainment and mix up the regular routine. I truly believe this lifestyle could keep me more than entertained for years on end. How Much Does My Perfect Day Cost? Here’s the amazing part: my perfect day is incredibly cheap. How big of a house does this lifestyle need? Do I need expensive clothes to enjoy this life? I don’t notice a specific car mentioned in my perfect day either. On the other hand, having time to cook a homemade meal is definitely cheaper than eating out. There’s no gas spent on a morning commute in my perfect day. Exercise is free, and even a fancy gym membership can be negotiated down to about $1 a day. More books than I could ever purchase are available for free at the library, and even the passion projects like blogging and stained glass making have potential to earn a little income. With a clear visualization of such a wonderful lifestyle, the choices become easy. Do I want the newest cell phone, or do I want a day like that? Do I want an extra 1,000 square feet I probably won’t have time to use, or do I want the time to start enjoying my perfect day, every day? Do I want some more stuff, or do I want to start living this day years earlier? Millennials Are Getting Screwed on Home Prices… Right? Great article. A lot of people Ive talked think they’ll get bored in early retirement. Not me. I’ve got too many great hobbies to even have time for work. Outdoors- fly-fishing, climbing mountains, hunting, jeeping, cycling, rafting, camping, etc. I could go on and on 🙂 And not just outdoors- there’s the want to become a great cook, a writer, interior designer, beer-maker, and all those books to read!! Also podcasts. Podcasts are an excellent source of mind-filler while you’re pursuing any of these things. Let’s not forget travel. Grab the book Vagabonding an use that as your guide to see something new at least a few months a year. That’s only the beginning of our plan. My wife could double that list. My belief is one should practice what will do once retired while on vacation or during their weekends. Then you can figure out what you really like. There’s a great horizon out there. Bring it! Sounds like an awesome plan. Cheers! Sounds like an awesome day; there are so many things to do! My afternoon would look like yours, and I am interested hearing more about your stained glass hobby. Would love to see some pix of your work! My perfect days almost exactly lines up with yours! Not sure about reading for that long though, ADHD makes it a little difficult to sit that long. I have also fallen in love with blogging and running a website. It’s such a great platform and outlet for my creative side. I never thought it would be so rewarding. I actually have an announcement. I will be committing full time to entrepreneurship next month ☺️ I am extremely excited but very nervous. Through our blog, ecommerce business, and home inspections I will finally be free to live the life I have always wanted. Getting married so early has been such a blessing. I supported my wife while working as a jail deputy while she finished grad school. Now she will support me while I take the leap of faith into full time entrepreneurship. Loving your content and can always relate to it quite a bit. Keep up the great work! Wow, congrats! Sounds like you’re living the dream! Keep me updated on how it goes, and best of luck! My day isn’t that different from yours. More coffee, less scrambled eggs, and more wine, but a lot of it lines up exactly. Simple pleasures are sometimes the best! Definitely. The skill to keep yourself entertained is priceless. I seriously doubt I’d be bored in retirement. I can think of plenty of hobbies and things to get into, even before we talk about my favorite existing past times. It sounds like your day has a pretty good plan as well. Hoping to buy some of that time back in retirement. Thanks for the kind words Jaymee! We’ll get there! Thank you for mapping out my perfect retirement day, almost. I am so glad you are living your dream and inspiring others. I’m getting a late start but hey, better late than never.